Yup, That ain’t no damn lie! Ruby Cramer, BuzzFeed News Reporter – Hillary Clinton has hired two political operatives from her 2016 presidential campaign to help manage Onward Together, the project she founded this spring with former governor Howard Dean to fund and support a coalition of Democratic groups led by activists and organizers. 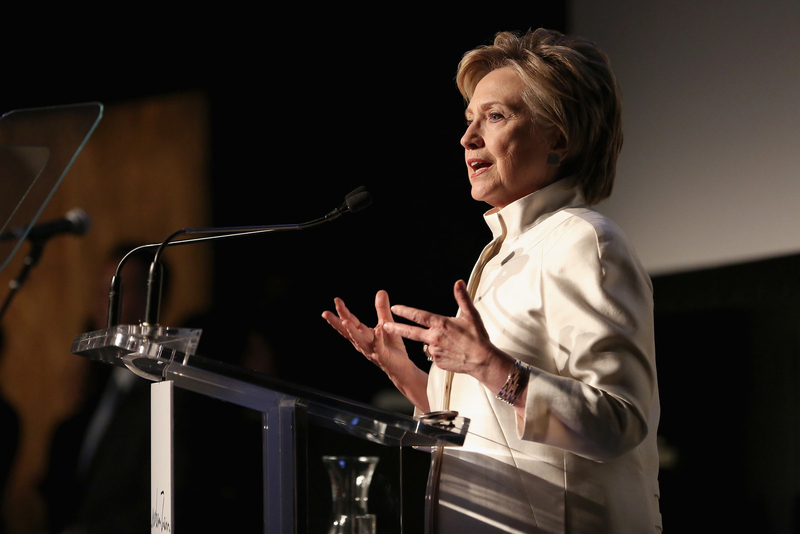 That Clinton play a role at all in electoral politics after her failed 2016 campaign is a source of debate among Democrats, some of whom have said that the former candidate should to step back, moving aside for new voices in politics. Clinton, however, has made it clear she is not receding entirely into private life: She’s made headlines for pointed remarks about Trump and Russia, and has a new memoir coming out next month that aides have described as a candid and at times raw account of the Democratic primary fight and the general contest against Trump. Donald J. Trump, a man who has demonstrated a complete lack of integrity, and the party he represents, have pushed this fellow right into the bosom of the resistance. Make no mistake, many differences exist between me and the resistance, but, given the choice of Trump and the party he represents or the resistance, well , it’s not even a contest any longer. the resistance wins hands down! Trump’s lying, xenophobia, misogyny, lack of principled leadership, narcissism, and so much more give a rational and reasonable person no choice but to resist him, everything he stands for, and the party who supports him. Simply put the man called Trump represents the greatest threat to decency and our democratic republic the nation has ever faced. His bullying personality, relationship with a nation hostile to American interests (Russia), and his affinity for strong-arm dictators illustrates this. In six short months Trump has the our allies and the world looking at America in a different light. A diminished light that will result in our nation losing its influence and place among nations. We will no longer be viewed as a leader to be trust, rather we will be looked open with distrust. Trump is responsible for this and as we will become more isolated as a result. We welcome HRC’s activism in resisting Trump and support her every effort to discredit both him and the ideology he espouses, whatever that may be. A man who has no core values other than what serves him has no business holding he top leadership spot in our republic. May the resistance grow and from this competent, honorable, experienced, patriot leadership arise! The BLOTUS’ behavior is indeed unmoored from reality. During the race to the presidency the BLOTUS showed us over, and over, and over again that he was unfit for the presidency of the already greatest nation on earth. Yet a minority of our population was able to elect him president. Largely thanks to gerrymandering, which tipped the outdated Electoral College in his favor. Not only does a majority of our own population serious question the BLOTUS’ judgment and integrity so do many other nations of the world. Mika Brzezinski and Joe Scarborough are absolutely right, and, every American who truly values the principles and moral values this nation was founded on ought to be concerned as well. It is very likely Trump, possibly the result of his privileged upbringing and life experiences, sees authority and authoritarianism as the path to an improved societal condition. But I digress, Please click HERE to read the complete article. To the above all a reasonable fair-minded person can say in response is, Ah, poor WATB. Apparently the author of this extremely biased pro Trump article is fine with his lies, half-truths, and stinky BS his White House has shoveled on the people of this once great nation. Trump deserves every damned bit of scrutiny he has received by the legitimate press. By the use of the term legitimate we definitely do not include Breitbart, INFOWARS, World Net Daily, Newsmax, or FOX News and Sean Hannity. There are many others but you get the idea. Donald J. Trump has made it a hallmark of his presidency to scream FAKE NEWS every time the legitimate news media calls him out on his many misstatement or outright lies. In so doing, and with the support of his adoring albeit ill-informed fans, he is regularly calling the legitimate news media credibility into question. A calculated strategy to delegitimize the very institution that is so critical to democracy. We leave it to you all to decide what Thomas Jefferson’s opinion of the BLOTUS might be were he here today. noun – an attempt to deceive someone into believing that one can or will do something. verb – try to deceive someone as to one’s abilities or intentions. Defining Trump’s character as well as any article we’ve read. Donald Trump said he had a secret. He out bluffed a weak democractic presidential candidate to become President of the Unites States. Now he can and likely will bluff a nation.